Run. Jump. Skip. Kick. Swim. Karate chop? We’re looking for great ideas to get people active. So whether the frosty weather makes you want to create a temporary ski run or Friday Night Lights has inspired you and your friend to set up your own American Football league – we want to see you move. MOVE! 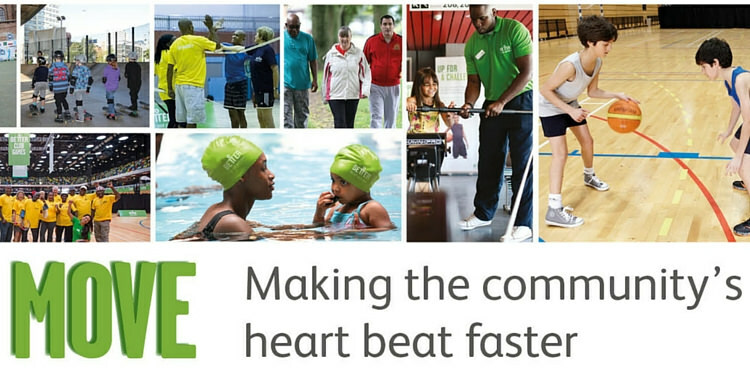 has been created to support projects in East London which get your community active. Using Spacehive (woo!) they’re offering the use of their spaces, the time of their staff, and match funding up to £70,000 to anyone who has a great idea to get people moving. If you want to organise a 100 metre sprint on your local high street, revamp a 5-a-side football pitch or run your own sports day (complete with races of the egg and spoon and three-legged variety), then MOVE! can help. Set up by the GLL Community Foundation, MOVE! aims to help everyone in the community to enjoy sports and physical activities. And getting involved is easy. First, tell us your great idea including how it would work, what’s needed, the timings, the costings, the permissions needed etc. by creating a project on Spacehive and linking it to the MOVE! page. Then show us the power of your idea through your killer crowdfunding campaign. Aerobics. Basketball. Capoeira. It’s as easy as abc. For more information on MOVE! click here. Join us at the London Aquatics Centre to hear more about MOVE! and to learn the skills you need to run a successful crowdfunding campaign. Register to attend free here.